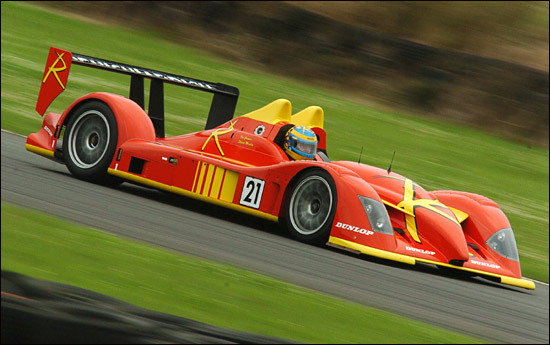 Pembrey in South Wales was the scene today of the first appearance of Tim Greaves’ Bruichladdich (say brook laddie) Radical SR9 – the second SR9 chassis to appear from the Peterborough factory, this one AER-powered. As confirmed here last week, Greaves and Stuart Moseley will drive the dramatically-liveried car on its debut at this weekend’s Le Mans Series 1000 Km. for the development of the SR3 and expansion into the current larger premises on the outskirts of Peterborough. 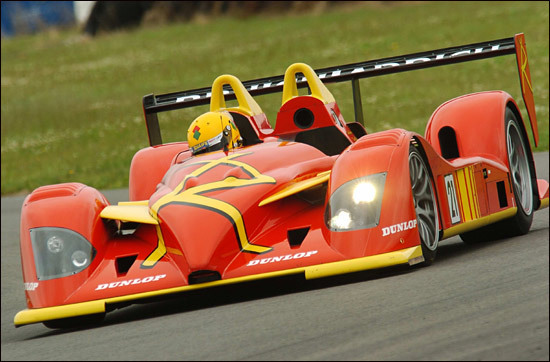 He has owned an example of every model that Radical has ever built, starting in 1998 with chassis number eight, a Clubsport car and this SR9 will keep his record going. The Bruichladdich distillery also benefited from a Greaves investment, and now the distillery gives its name to the team. The news that Paul Thomas is to manage and engineer the project confirms that this is a very serious programme. “Longer term we’re looking to have a two car team for 2007 competing in the Le Mans Series and hopefully a class win both there and at Le Mans,” suggests Tim Greaves. That will mean taking on what is likely to be a fleet of Porsche RS Sypders next year, so Tim Greaves obviously has plenty of confidence in his project.